Carson Daly with Tom Cruise on MTV's TRL to promote his new movie "Vanilla Sky" at the MTV studios in New York City on December 3, 2001. A new version of MTV's beloved TRL program is set to premiere on Oct. 2. "The daily live show will air from the network's iconic Times Square studio and become the prime destination for youth culture and a meeting point for millions of fans," a press release from the network explained. "The show will integrate linear, social and digital under the TRL brand and bring teen passion points to life, while continuing to incorporate audience requests." From bare bellies to unnecessary hats, these are just some of the looks that defined a generation. The program will feature as rotating hosts D.C. Young Fly, Erik Zachary, Amy Pham, Tamara Dhia and Lawrence Jackson. 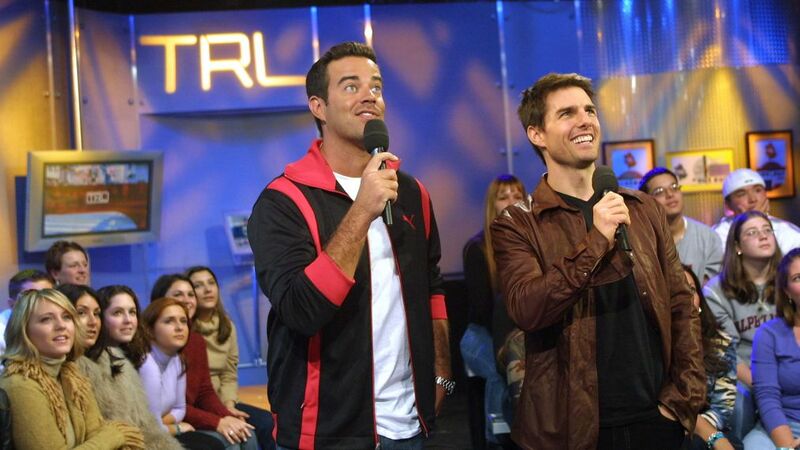 TRL, also known as Total Request Live, initially ran 1998-2008 with Carson Daly, then Damien Fahey as hosts. The teen-oriented show primarily featured music videos and celebrity interviews.